Writing 7100 prepares new instructors of Cornell’s First-Year Writing Seminars to teach courses that both introduce students to particular fields of study and help them develop the sophisticated writing skills they will need throughout their undergraduate careers. Seminar discussions and readings on pedagogical theories and practices provide an overview of the teaching of writing within a disciplinary context. Participants develop written assignments designed to be used in their own First-Year Writing Seminars. Course Syllabi for Summer 2018 and Fall 2018 are available for download. The eCommons Digital Repository contains an archive of Assignments and Classroom exercises used in First Year Seminars and other Writing classes at Cornell. Many of these assignments have won either the James Slevin Assignment Sequence Prize or the Knight Award for Writing Exercises and Handouts. This eCommons resource is available to Cornell instructors only. Writing 7101 is a one-credit course, offered S/U only. Writing 7101 begins in the first week of the fall or spring term and meets weekly on Thursday evenings for six weeks. 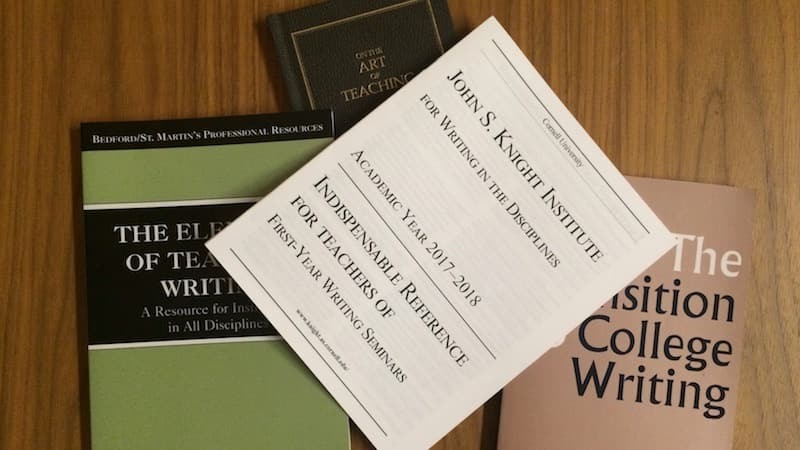 Graduate Writing Service tutors – experienced teachers of writing from multiple disciplines – work with Cornell graduate students, post-docs, and faculty to refine and develop strategies for planning, drafting, and revising teaching materials. Teachers of writing can schedule face-to-face meetings or online appointments (using an internet-based video and messaging platform). Tutors can also provide written feedback on drafts through our eTutoring system. Schedule an appointment at Appointment@GWS. draft and refine teaching artifacts -- like the course syllabus, writing assignments & handouts. develop lesson plans, writing assignment sequences & classroom activities. review student essays and discuss response strategies, evaluation & grading. workshop teaching statements & philosophies. GO TO APPOINTMENT@GWS TO SCHEDULE AN APPOINTMENT! The English Language Support Office (ELSO) offers a series of workshops designed to introduce international graduate and professional students to different aspects of writing and speaking. To learn more about these workshops and register, visit the ELSO website.